8. Who are locusts in Revelation 9:2,3? The "locusts" appear with the sounding of the fifth "angel" in the fifth stage of the Christian Age Church. They are called "plagues" (Revelation 9:1-11). Plagues are what ultimately destroy Christendom called "Babylon" (Revelation 16:19). What would ultimately destroy a system of error like Babylon? Truth, of course. In fact, the very last plague is identified as a "plague of hail" (Revelation 16:21). And Isaiah 28:17 says, "the hail shall sweep away the refuge of lies." Who is the "angel"? Wycliff has been referred to as the "morning star of the reformation." He had the "key" to open the "pit." This prefix to "abyss" would then denote Truth, as water, which had been suppressed was then released by Wycliff's ministry. 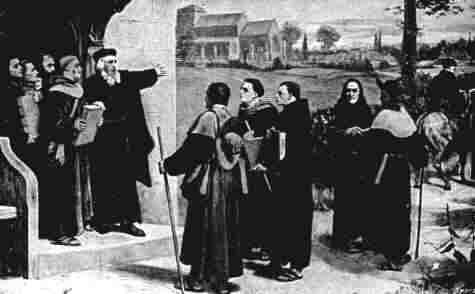 Wycliff's followers, the Lollards, penetrated every hamlet and countryside and even some of the monasteries of the false church. They were, indeed, a plague of "locusts" to Papacy! The similarity of these locusts to scorpions was apparently in their tails. Isaiah 9:13-15 gives a clue as to the meaning of "tails""For the people turneth not unto him that smiteth them, neither do they seek the Lord of hosts. Therefore the Lord will cut off from Israel head and tail. . .The ancient and honorable, he is the head; and the prophet that teacheth lies, he is the tail." From this clue it may be deducted that the Lollards were effective as teachers in "stinging" errors with Truth! Instead of dying to their Catholic condition, people stayed in an unsettled, agitated state for "five months," that is 150 years (5 x 30 = 150 days/years). There was no ready and satisfactory alternative to the papacy until the Protestant Reformation, more than a century later. Wycliff's followers were known as "Lollards,"
who were represented by locusts with tails, "like unto scorpions, and there were stings in their tails." For more information on the Locusts.